The Jena Giants had been relatively quiet in producing football players and sending them to the next level. In fact, the Giants have not had a player that was offered a full scholarship to play football in the last ten years. That ended this year for Jena High School when senior TE Parker Fink received some offers from McNeese State, Nichols State, and Stephen F. Austin, but in the end, Fink took his talents to Northwestern State. Over his career, Fink has pretty much accomplished everything that you can do at the high school level from catching touchdowns to wrecking havoc on defense. At 6’4, 244, Parker Fink showed his versatility as a tight end as well as a defensive end. In his senior year, he had over 160 yards receiving and three touchdowns. On defense, he added 40 tackles, three sacks, two tackles for a loss, and a fumble recovery. Another underrated part about Parker Fink’s game is that he is a very capable blocker when he is not lined up to catch passes. He also has racked up many awards and recognitions including making the All-Cenla team and the All-State team. Even with everything that Fink was able to accomplish over his Jena football career, his biggest accomplishment was helping put Jena football on the map in the state. Over the last two seasons, the Jena Giants won over twenty games including two playoff victories. Parker Fink might go down in the program’s record books of what he was able to accomplish statistically, but there is no doubt that he was also a key place in helping Jena take the next step as a very good football program for years to come. We caught up with the former Jena tight end and Northwestern State signee as he talked about his high school career, the reason why he chose the Demons, and so much more in today’s recruit spotlight! LAFM: What are your stats and accomplishments while at Jena High School? Over my career, I had 18 receptions for 271 yards and four touchdowns on offense. On defense, I had 57 tackles, five sacks, five tackles for loss, two forced fumbles, a fumble recovery, a fumble recovery, and a blocked field goal. In 2014, I was named HM offensive line All-District. In 2015, I was named LFCA 1st Team All-State at tight end, All-Cenla honorable mention at tight end, and 1st Team All-District. This season, I was named All-District as a tight end and defensive end, All-Cenla 1st Team as a defensive line, and LSWA All-State honorable mention as a tight end. LAFM: You have signed with Northwestern State to continue your football career. What is it about the Demons that has attracted you to play football for that program? One thing that has attracted me to play football the most at Northwestern State is the atmosphere of it, and they use the tight end a lot so that makes it very exciting. LAFM: You have played both tight end and defensive end at Jena. Which position did you enjoy playing more and which position will you play at the next level? I love both positions, but there is nothing like catching the ball and fighting for extra yards especially when people underestimate you. I will play tight end at NSU. I love to catch the ball, but I also don’t mind going down and crackling somebody. My size and ability to move are some of my strengths. LAFM: What are some things that you need to improve on when you get to Northwestern State? I need to be successful and to continue my education. LAFM: Who is the college or NFL player that you model your game after? I model my game after Rob Gronkowski (New England Patriots TE) because of his attitude on and off the field. LAFM: What is your pregame routine? I usually get some food and just relax in order to get into my mood. I listen to Eric Thomas to get my mind right. LAFM: What is your intended major for college? LAFM: You helped lead Jena to the 2nd round of the playoffs in your senior year. What are your thoughts on the season as a whole? We were a young team losing seven defensive starters and 15 seniors total. Everyone underestimated our season. We did well, but some games have gotten away from us just from the young experience we had. After football season, I love to hunt. On all the free days I get, I use to go sit in the blind and duck hunt. I also enjoy hanging out with my boys! LAFM: What was your favorite game while at Jena and why? My favorite game was in my junior season when we hosted our first home playoff game in many years. The atmosphere of that game was amazing. By far, it was the best and most exciting game ever making us 11-0. I’m a humble person and a good team player that will put my teammates first. 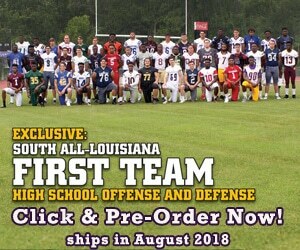 LAFM: What are you going to miss most about playing high school football in Louisiana? I am going to miss just being in high school and the atmosphere of our small town because football is our town. LAFM: What does it mean for you to play and attend school at Jena High School? It’s amazing because everyone looks up to you, and you feel like a star in ways that you’d never imagine. LAFM: Is there anybody in your family that has played sports? My dad played baseball, football, and basketball in high school. My mom was a cheerleader, played softball, and ran track. My oldest sister Brittney played softball and danceline in high school. My older sister Paige was also a cheerleader and played softball where she now plays in college. I just want to thank God, my family, my coaches, all of my supporters, and Jena High School. LAFM: Why should Northwestern State fans be excited about having you on their football team? I love to make plays and be a part of a winning team. I want to help NSU build and become the best that I can for not only myself, but for them.